Wait for the backup job to complete. Note: We don’t use the cluster backup, it’s just taken as extra backup. It is important that the cluster backup name is different to the node backup name, otherwise it will overwrite. Boot the node (boot_ontap if you’re at the LOADER> prompt). This will delete critical system configuration, including cluster membership. Warning: do not run this option on a HA node that has been taken over. Type “y” to the warning. Then it will reboot again. When it comes back up, it will have forgotten its identity (you’ll see localhost in the messages) and the login prompt appears. The login is now admin with no password. Q: How to we restore this single node SIM cluster? And the node will reboot back to the login prompt, with its identity has returned! What there some purpose to this? option (4) to initialize all disks and setup a new system. 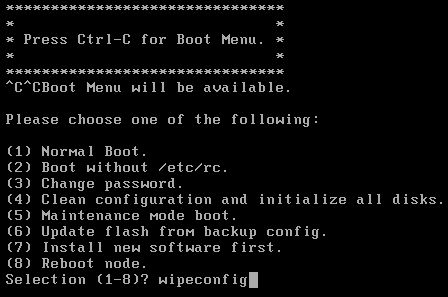 It’s very good that the Normal Boot is prohibited here, since with the ARL and cDOT disruptive headswap, it is essential to do the option 6 “Update flash from backup config” after the disks have been reassigned and before first fully booting up ONTAP.